Book some of the wide-ranging tours available. 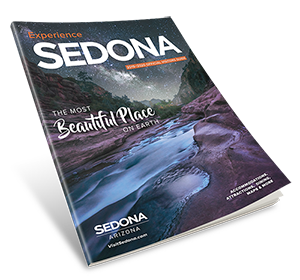 Sedona occupies a slender stretch of habitable space, surrounded on all sides by national forest land. With a backyard full of wild country the urge to see it all is practically overwhelming. Maximize your time with a little help from local guides. Jeep tours are a cottage industry for the burg. Several companies go bouncing into the outback away from the crowds, into the secret places. Each outfit offers signature rides from gentle scenic excursions to off-road adventures with enough jeep acrobatics to put a smile on the face of even the surliest teenager. Along the way the drivers provide insight into local history, geology, flora and fauna. Other Wheeled adventures in and around Sedona include ATV’s and Segway tours. Of course, there’s something about such a dramatic landscape that begs to be viewed from above. Thrilling helicopter rides dip in and out of backcountry canyons with ease, buzzing through corridors of vertical stone and gliding along knife-edged ridgelines with the vistas splashing through the windows. Witness the Sedona that only eagles see. Don’t forget to explore Astronomy & Specialty Tours for something out of the ordinary. Or greet the sunrise aboard a hot air balloon. Rarely a day begins without several of the great soft beasts dotting the skyline. They rise on gentle breezes above the forests, above the sandstone columns in the pre-dawn light that shimmers electric, until suddenly the rising sun bursts over the horizon, bathing everything in hues of gold and honey. Perhaps you want a personalized experience. Knowledgeable photographers will teach you their tricks about how to capture such an immense landscape in a tiny camera lens on photography tours. You can sign up for vortex tours, hiking and biking outings or kayak floats. The only hard part will be squeezing them all in. Maybe you should plan to stay an extra couple of days, just to be safe.